Published Wednesday 15 March 2017 Ealing Council’s cabinet has agreed to consider a loan of £165million to its wholly owned housing subsidiary, Broadway Living. If approved, the loan will be used to build more homes to meet rising demand in the borough. 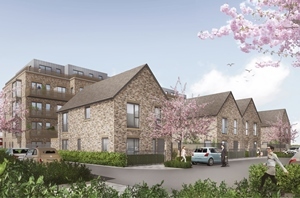 The council wishes to build new homes over a range of tenures and price points and Broadway Living is a new delivery vehicle for achieving this. Since October 2013 it has delivered 10 new homes for market rent and 32 new homes for intermediate rent. Broadway Living is also leading the renewal of the Copley Close and High Lane Estates in Hanwell. When finished, they will have refurbished 550 homes and built 280 new homes; a proportion of which will be retained for market rent, discount market rent and sale. The revenue from this activity will then be used to subsidise the development of more housing. In addition, Broadway Living is set to enter into a partnership with the company chosen to redevelop the existing council headquarters site of Perceval House in Ealing Broadway. This is expected to deliver around 200 new homes. The council is also using Broadway Living to partner with private developers to deliver discounted market rent units as part of their s106 obligations. Broadway Living is now creating a business plan to set out its proposed future development objectives over eight different sites. If the £165million loan goes ahead, Broadway Living will seek to create 760 new homes across the borough. Councillor Jasbir Anand, cabinet member for housing, said: “The cost of housing is a major issue for our residents and increasing numbers struggle with finding somewhere to live. Our ambition is to build more good quality homes at a variety of price points. We have been working successfully with developers to achieve this, but we want to do more. More information about Broadway Living can be found on their website. The decision was made by the council’s cabinet on Tuesday, 15 March. All cabinet decisions are subject to call-in for a period of five working days from the date of publication of the minutes of the meeting.